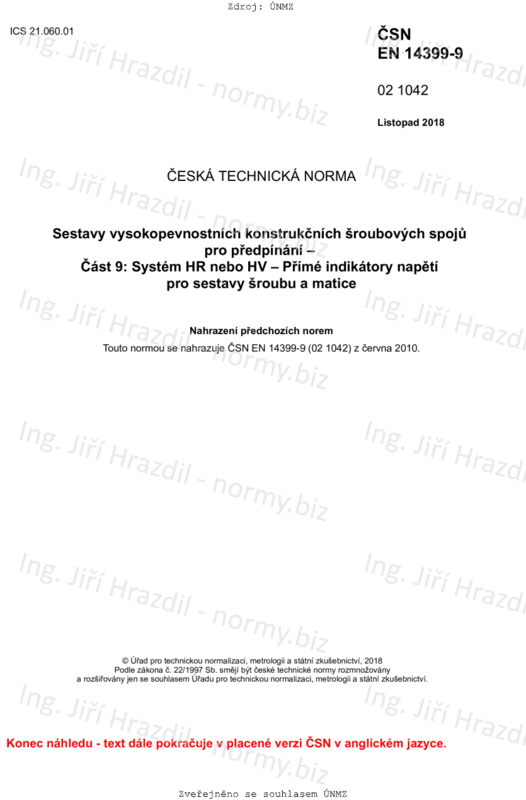 This document specifies, together with EN 14399-1 and EN 14399-2, the requirements for direct tension indicators, nut face washers (HN) and bolt face washers (HB) as part of high-strength structural bolting assemblies suitable for preloaded joints. These direct tension indicators are specified as part of high-strength structural bolting assemblies of system HR or HV in accordance with EN 14399-3, EN 14399-4, EN 14399-7 or EN 14399-8, with nominal thread sizes M12 up to and including M36 and property classes 8.8/8 or 8.8/10 and 10.9/10. It specifies two property designations H8 and H10 for direct tension indicators, together with general dimensions, tolerances, materials and functional property/ies. Bolting assemblies in accordance with this document have been designed to allow preloading of at least 0,7 fub × As1) according to EN 1993-1-8 (Eurocode 3) and to obtain ductility predominantly by plastic elongation of the bolt for system HR in accordance with EN 14399-3 or EN 14399-7, or by plastic deformation of the engaged threads for system HV in accordance with EN 14399-4 or EN 14399-8. Bolting assemblies conforming to this document may include washer(s) according to EN 14399-6 or to EN 14399-5 (under the nut only). NOTE 1: Attention is drawn to the importance of ensuring that the bolting assemblies are correctly used if satisfactory results are to be obtained. For recommendations concerning proper application, reference to EN 1090-2 is made. General requirements and requirements for suitability for preloading are specified in EN 14399-2 together with Clause 5 of this document. NOTE 2: Direct tension indicators are also known as load indicating washers.